Bing yesterday revamped their Bing webmaster tool. With the new design of Bing webmaster tools webmaster can now easily find more details about there website how our website doing on Bing search engine. 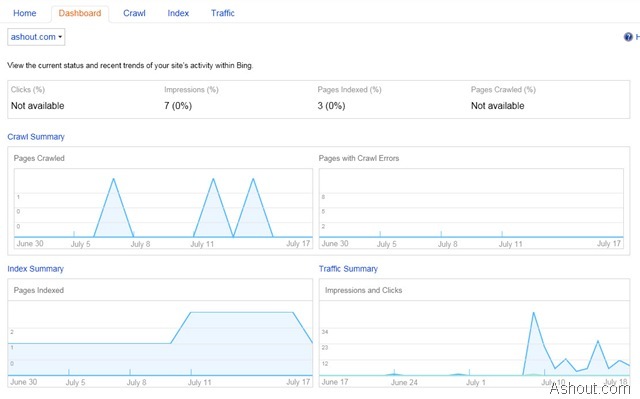 In earlier version of Bing webmaster tool, webmaster are not able to see the details about how’s our website going on Bing. But with the help of new Bing webmaster tool webmaster can easily find some more details about how our site is doing. The new design much more similar to Google webmaster tool, but it doesn’t contains all the functions which is available in Google webmaster tool. Here is the some details about new in Bing webmaster tool. Forcing to use Silver Light: In pervious version or older version we can visit Bing webmaster tool without having Silver Light but with the new version you are forced to use Silver Light on your system. When you login to you Bing webmaster tool without installing silver light within your computer, then you get pop-up alert to install Silver light on your system. Stats in Dashboard: I think this a new feature. Now we can see quick stats of our blog in the home page itself. This stats gives the Clicks, Impressions, Page Indexed and Page Crawled stats. Dashboard: When we click on the Dashboard we will see graphical result of our blog as we seen in Google webmaster tool. This page gives a graphical and clear view about our site in Bing. New Tabs: They have also added new tabs in webmaster, they are Crawl, Index and Traffic. When we click on those tab we will see some more information about that topic. 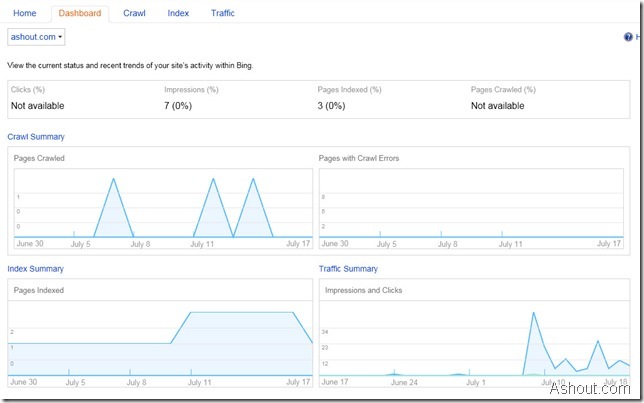 Don’t forget: There are more and more features available in new Bing webmaster tool. And don’t forget to see the left column to get new updated feature which is available in Bing webmaster tool. Most of the new tools are added in this section only and most users don’t see that section itself! Go and visit Bing webmaster tool to explore new features available in Bing. Will it make any problem if we use google webmasters and bing webmasters both for our site. R U sure? R U using both? if yes then from when? Plz ans me bcoz I m little bit hesitate to register on bing. I’m using both and i’m also using Yahoo too… the more you use the more traffic you get to your site.